The geological features of the summit area of Haleakalā strongly influence the conditions under which plants, animals, and insects live in the alpine/aeolian zone. The history and influence of these features is not always easy to decipher. 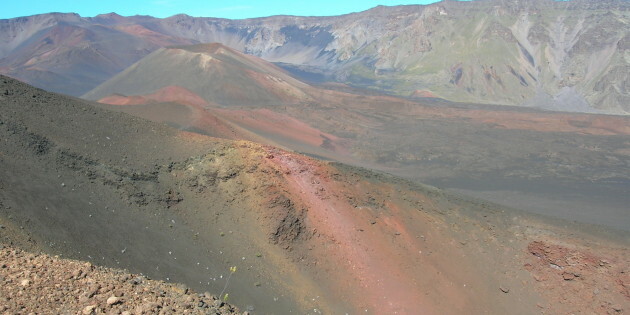 This unit helps students explore the geology of the summit area, focusing on what we can find out about the alpine/aeolian ecosystem and the geologic processes that shape it by observing and studying Haleakalā. Students study the origin of Hawaiian volcanoes, including Haleakalā, and relate the history of these volcanoes to present conditions in the alpine/aeolian ecosystem. Students learn how geologists apply the scientific method to posing and answering questions about the past and future of Haleakalā and describe examples of hypothesis creation and testing. Students play a game in which they demonstrate their knowledge of the geology of Haleakalā and proper visitor behavior in the alpine/aeolian ecosystem. 1. What can we learn about Haleakalā by studying its geological features? 2. What can we learn about the conditions for life in the alpine/aeolian ecosystem from studying the geological formations of Haleakalā? 3. How do geologists use science skills such as observation, hypothesizing, collecting data, and analysis to answer questions about Haleakalā? Geology of the summit area and how people study it. The geological features of the summit area help shape the conditions under which life survives in the alpine/aeolian zone. • Simulate the process of predicting volcanic eruptions by placing Alka Seltzer in water in a film canister and closing the lid. Before you do this, ask for predictions about what will happen after you cap the canister. Have students predict how much time it will take for the canister to “blow its top,” then compare predictions to the actual elapsed time. Link this activity to the general theme of the unit by explaining that geologists studying Haleakalā and other Hawaiian volcanoes are interested in when the volcanoes will erupt again. They gather clues from the layers of rock produced by past eruptions and use that evidence to help them predict when and where future volcanic activity is likely to occur. In making their predictions, scientists rely on basic science skills such as observation, discerning patterns, and sorting out likely effects of different variables. – Repeat the process several times using the same proportion of Alka Seltzer and water. Calculate the mean eruption time, and the range. Make the point that scientists can predict future eruptions based on past patterns, but there is still variation. calculate the average error, throwing out the data from the first round. Teaching point: The first round helped them “calibrate” their predictions, probably leading to more accurate predictions in the second and subsequent rounds. – Mark film canisters with different colored labels and vary the amount of Alka Seltzer in each. Ask students to predict how long each will take to erupt. Then time and record each “eruption.” Then do one final “eruption” without telling students how much Alka Seltzer you used. Have them estimate the quantity of Alka Seltzer based on past observations. Teaching points: Different types of volcanoes and individual volcanoes at different stages of development have different eruptive patterns. Scientists compare current eruptions with past eruptions to learn about the volcano’s stage of development. • Brainstorm other variables that could affect the timing of the film canister “eruptions.” These could include the fit of the lid, small variations in the amount of water or Alka Seltzer used, outside air pressure and temperature, and so forth. Then brainstorm a list of factors that might influence the timing and/or character of a volcanic eruption. Students may not know a lot about volcanoes, so this list may be quite general. You may need to give students clues. Use this brainstorm to set up the rest of the unit. • Following the Activity #1 comparison of cinders to soil, have students design an experiment to compare the two as growing media for plants under different climatic conditions. • Have students select a topic about Hawaiian volcanoes and research it using Internet and print resources. • Have students make an educational display and presentation about the formation of Hawaiian volcanoes and the geological history of Haleakalā for a younger class. • While students are playing Activity #3 “The Dating Game,” have them keep track of questions they miss. As homework, have students explain the correct answer to each question. Hazlett, Richard W. and Donald W. Hyndman, Roadside Geology of Hawaiʻi, Mountain Press Publishing Company, Missoula, Montana, 1996. Macdonald, Gordon A., Agatin T. Abbott, and Frank L. Peterson, Volcanoes in the Sea: The Geology of Hawaiʻi, 2nd edition. University of Hawaiʻi Press, Honolulu, 1983. Hawai’i: Born of Fire, NOVA video production, 1995. One hour in length. Order from 1-800-949- 8670.